Some new plants were added to our little garden paradise in December. Not perfectly timed though as we purchased them three days too early, just before our dearly beloved mother’s (John’s mom, my mother-in-law) unexpected sudden demise on December 12th. She’s much loved and missed by us all but God loves her more. Inadvertently, the garden was neglected during our recent bereavement and needless to say, there were some casualties during the couple of weeks surrender to nature’s harsh heat. 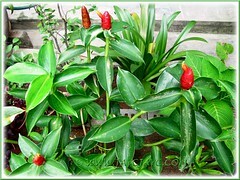 Fortunately, a pot of Costus woodsonii (Red Button Ginger) that were newly planted at our inner border survived the ordeal and even managed to produce some suckers. 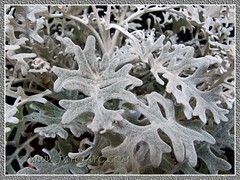 However, some leaves were scorched and appear unsightly while others have yellow spots on them. Hoping that the yellow leaf spots were caused by water on the leaves with exposure to direct sunlight or nutrient deficiency and not some pest infestation. For a start, I’m going to snip the affected leaves, fertilize the plants and keep fingers crossed that over time, they will regain their health and vigour. Just behind the clump of Costus woodsonii at the inner plot, we have planted a cluster of Hymenocallis caribaea (Caribbean Spiderlily) and thrust a bottomless pot of Wrightia antidysenterica (Snowflake, Arctic Snow) beside it. Hopefully, these new additions that will bear beautiful white flowers will add a lovely contrast to the Red Button Ginger in front. 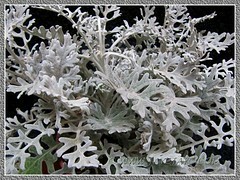 Artemisia stelleriana ‘Silver Brocade’ was another newly acquired plant. 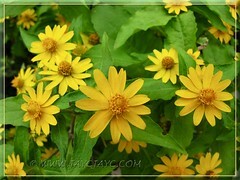 Melampodium divaricatum (Butter Daisy) rejoined our garden finally. We’ve given up planting this bright and cheerful beauty more than 5 years ago when heavily infested with white flies. But time is a healer and when we came across them recently and saw their pretty faces beckoning, we became soft somehow! Our 2 plants are still housed in the black plastic nursery bags. Hope to plant them when I have the time to overhaul the outer garden border. 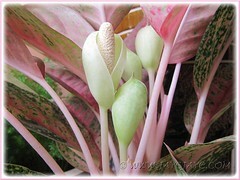 Aglaonema cv. Legacy decided to present us with 4 lovely flowers (a pair on each plant) for the first time. How rewarding! These were the clump of plants replanted in a larger container in mid-October 2011. Cool… they must be loving their new house, huh! Very sorry to note your loss of your family member. May God bless her soul & that she find everlasting place with the Lord. I too have the Red Button Ginger. Do not throw away the spend branches. When you trim them – plant them in a pot – you will find new sprouts coming from the nodes. Also you will find new sprouts coming out from the spend flowers. Happy New Year Jacqui, my condolences on the passing of your MIL. 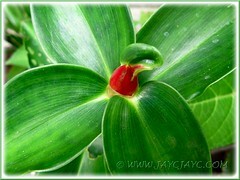 Even if you say the spiral ginger had suffered, it doesn’t show in the picture here, it is still lovely. I have been looking for the wide angle shot of your garden as i know you have a lot of plants, but i can’t locate them. Your plants are always looking lush and healthy, so i am sure the total area is healthy too. Btw, i just applied to AdSense so i recognized your so many adds in this site. I am not sure if i will be accepted. The first time i applied i was rejected for the labels, so i cut it to minimum, at my difficulty finding my old posts by plants. James : Thank you, we appreciate your kind thoughts and prayers. Wishing you and yours a blessed and successful New Year too. Will definitely follow your advice on propagating the Red Button Ginger. I did thrust a stem cutting into the ground, but it shriveled and died, probably due to our current dry season. We’d love to get a dense clump soonest, so I’ll try again in a pot this time and locate it at a cooler site with filtered sunlight. Andrea : Best wishes for a great New Year to you too. Thanks for your kind sympathy during this time of our grief. Thanks for the confidence regarding our plants, but if you examine the photo closely, you’re sure to find the flaws on the foliage… haha! Wish you success with your AdSense application and may you reap $$ from your blog.